To make your school project stand out from all the others, create three-dimensional planetary models. Any student can create a smooth, round ball to represent one of the planets in our solar system. However, it takes artistic ability and an understanding of planetary geography to create models with color and depth. Press 2-inches of a thin dowel rod into a foam ball. Press the other end of the dowel into a foam block. You will know have both hands free to work on the model. In addition, you can use this method to display your model later. Cover a foam ball in a base layer of modeling clay. 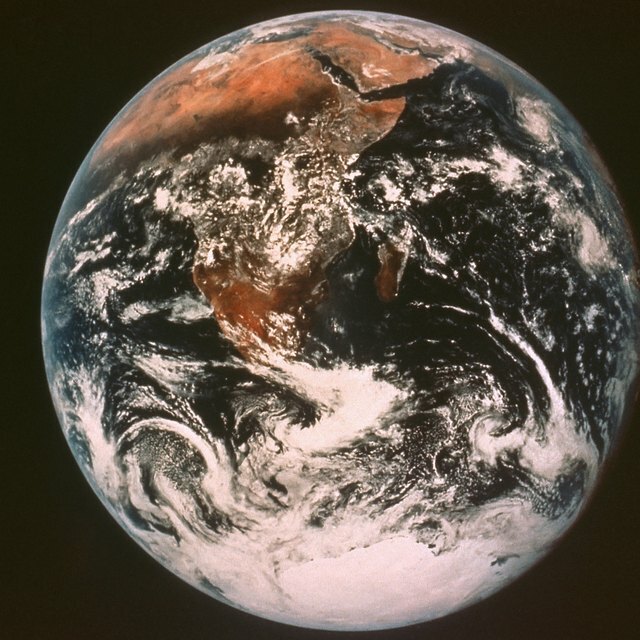 For example, the base color of Earth would be blue to represent the oceans, while the base color of Mars would be red. The layer should be at least 1/2 inch thick to allow you to add depressions later. Roll out different colors of modeling clay flat on your work surface. Use green or brown for the contents of Earth. Yellows, browns and creams will supplement the strips and swirls of Jupiter’s atmosphere. Cut shapes from the modeling clay using a utility knife or a pizza cutter. Think of the surface of the planet as a jigsaw puzzle and you are cutting out the pieces. Wet the base clay with water and apply the secondary features to the moistened clay. Build several layers to indicate forms like mountains. Do not forget to place important features on the bottom of the planet. Carve features like canyons with a toothpick or press a pencil eraser into the surface to create round craters. Cut 1-inch wide by 3-inch long strips of paper. You can use newspaper and paint your model later or use colored construction paper. Bring five cups of water to a simmer, which is at or just below the point of boiling. Mix 1/4 cup flour and 1 cup of cold water in a bowl until runny. Add the mixture to the simmering water and bring the pot to a boil, stirring constantly for 2 to 3 minutes. Allow the paste to cool before using. Dip the paper strips into the paste and cover the foam ball in a single layer. Build contours on the surface of the planet with successive layer. Pinch, wad and tear the paper as necessary to create continents, craters and mountains. Allow the paper mache to dry for at least 48 hours before painting with poster paint. Draw a circle on a piece of cardboard with the same diameter as the foam ball you are using for Saturn. Using the center of the circle you just drew, draw another circle around it that is twice the diameter. For example, if you are using a 4-inch foam ball, you would draw a circle with a 4-inch diameter and an 8-inch diameter. Cut out the both circles with a utility knife. Discard the smaller circle and keep the ring. Cover the ring with the same medium used to create the planet. Do not cover the inside of the ring. Apply paper mache paste or a thin layer of modeling clay (whichever you used to create the rings) around the equator of the foam ball and press the ball into the center of the rings. Allow the clay or past to dry before forming the rest of Saturn. Watson-Price, Erin. "How to Create 3D Planets for a School Project." Sciencing, https://sciencing.com/create-3d-planets-school-project-12131959.html. 13 March 2018.